Whether you know it or not you have a gluten free Asian pantry. It may only contain gluten free soy sauce and that’s how it all starts. You create a system to purchase and replace the necessary staples you want to have on hand for everyday cooking. Whether it’s an app on your phone or a notepad in your kitchen you just need a simple system that makes sense and works for you. Know what you have in your fridge, freezer and cupboards. Store these items in a way that works for your style of cooking and frequency of use. Restock items before you run out. A well-stocked pantry is the key to cooking a variety of delicious homemade meals day after day. Just a few minutes of planning will pay off every time you cook and shop. Whether you are whipping up a quick dinner or planning something more adventurous a well-stocked pantry makes life in the kitchen more enjoyable. Throughout this website I have written about many gluten free Asian ingredients and posted recipes for sauces I make, the ones I can’t find at the store. Now it’s time to put that information together in a more useful format, a simple list of ingredients for an Asian pantry. I provided a link to the actual product I use where possible. After that I’ve put links to my recipes to show you how I use each ingredient. And as always, when you follow a link to a recipe there is a description that often contains helpful information about the specific ingredient. Garlic – I like fresh but a jar in the fridge works too. Ginger – Fresh ginger will keep in the fridge or freezer; a jar of chopped ginger is okay too. Soy Sauce – Have a tasting to learn the finer points of tamari and soy sauce and pick a favourite; buy two at a time so you won’t run out. You can even buy individual travel packs of GF soy sauce, available in packets of 50 or 20, to carry with you. 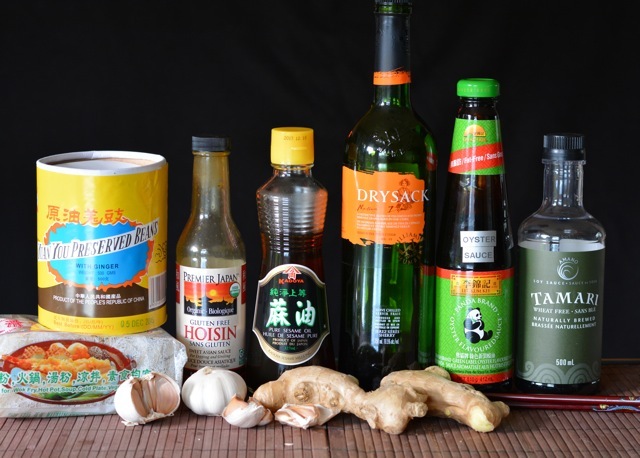 Oyster Sauce – Lee Kum Kee has oyster sauce, and the one with the GREEN label is gluten free. Use it to perk up an everyday stir fry , Lion’s head meatballs or use in a marinade/sauce. Sherry – I buy W&H Dry Sack sherry at the liquor store and use it for salad dressing, stir fry, salmon and more. Use it in recipes calling for cooking sherry or Chinese cooking wine. Fermented Black Beans – I use this ingredient to make my homemade black bean sauce. Homemade gluten free Black Bean Sauce – Use in an everyday stir fry, salmon or Hoisin ribs. Coconut Milk – for curries, soups, coconut rice and ice cream. Learn more about the different kinds in my coconut milk post. Fish Sauce – the essential ingredient of Vietnamese and Thai cuisine. Don’t smell it, just buy it! Read more about it in my fish sauce post. Sriracha chile sauce – you don’t need every type of chile sauce but this one is popular. Rice paper wrappers – if you love salad rolls make them a few times and you’ll wonder why you didn’t try sooner. Sweet Thai Chile Sauce – another chile sauce is not mandatory but it can be used as a dipping sauce for chicken or Spicy Thai Meatballs in Lettuce Cups, served with these Pork and Shrimp Lemongrass Skewers , in my sweet chili ribs and this Beef and Bok Choy Stir Fry. Lemongrass – fresh or frozen; use it in soup, Hoisin ribs or marinade; or use lemongrass stalks as skewers in Pork and Shrimp Lemongrass Skewers. Learn more about this ingredient in this post, How To Use Lemongrass. Rice vinegar – for rolled sushi, Sushi Pizza, California Roll Salad or Korean Short Ribs. Pickled ginger – sold in jars to use for rolled sushi, Sushi Pizza and California Roll Salad. Homemade gluten free Kecap manis – Use this sweet soy sauce for chicken satay and peanut sauce. Tamarind concentrate or paste – read my post on tamarind to determine which type you want to buy then use it in Pad Thai, satay and pork curry. Also used in East Indian cuisine. Whether it is the first time you’ve thought about your Asian pantry or you have some basics and want to expand, I hope you found this helpful. Let me know in the comments below what you keep in your Asian pantry or if you have a clever way of ensuring your pantry is well stocked. Hi Kim. I can always buy gluten free Hoisin at Planet Organic and I can never buy it at the many Asian markets around Calgary. I hope you find some! Where is a good place in Edmonton or Calgary to buy GF hoisin sauce? Thanks!